Processing near real-time analytics from big data is a goal for any data scientist. As Hadoop, SPARK and other processing solutions ingest more and more data, it is critically important to maintain low latencies. 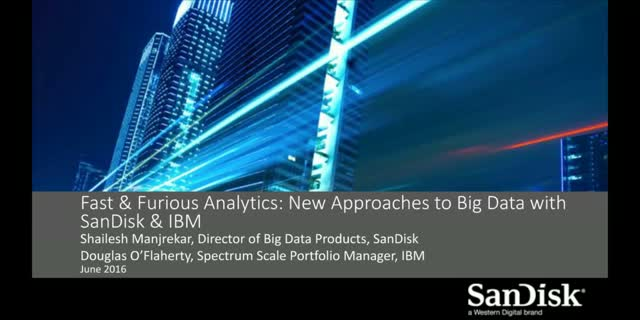 Learn how to accelerate Big Data analysis by combining existing Hadoop Distributed File System (or other data processing solutions) with IBM Spectrum Scale software on the SanDisk InfiniFlash System. In this webinar, Doug O'flaherty of IBM and Shailesh Manjrekar of SanDisk will show you how this joint solution delivers a faster, cost-effective and operationally efficient way to process and analyze your data.